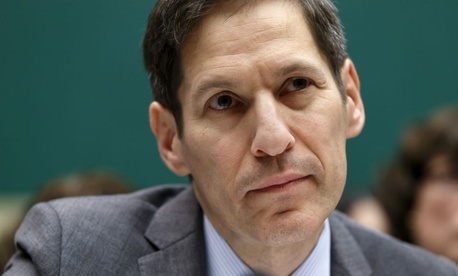 When Dr. Tom Frieden admitted on Oct. 14 that the government’s point agency battling the Ebola threat “could have been more hands-on with the hospital [that handled the first case of the deadly virus in the United States] from Day 1,” it was a wrenching admission for the director of a long-proud team at the Centers for Disease Control and Prevention. Frieden’s acceptance of partial blame for delays in protecting health workers at the struggling facility in Texas came after the CDC for a decade had enjoyed Gallup Poll approval ratings solidly in the 60s (its approval rate fell in another poll to 37 percent last week). And the Atlanta-based agency’s highly specialized staff of 8,500 earned a ranking as 49th out of 300 sub-agencies in the 2013 Best Places to Work in the Federal Government compilation by the nonprofit Partnership for Public Service. But Frieden’s mea culpa came just three months after another publicly expressed regret. This July 11, a CDC after-action report was released concerning the June 2 revelation that as many as 84 CDC scientists may have been exposed to deadly anthrax. CDC’s response that day also wove in an announcement of the discovery that a scientist back in January had mistakenly cross-contaminated a dangerous strain of bird flu with another and sent the combination to an Agriculture Department lab without following proper procedure, yet no one reported the violation. The result was the temporary closure of two labs. And that came only 10 days after CDC reported that National Institutes of Health employees discovered vials of 60-year-old smallpox in a storage room in a Food and Drug Administration laboratory. “These events should never have happened,” Frieden told reporters. The American people “may be wondering whether we’re doing what we need to do to keep them safe and to keep our workers safe,” he said. Such investigations of potentially dangerous violations of protocol actually have been conducted on the CDC going back at least to 2008 under the George W. Bush administration, leading some in the infectious disease and bio-terrorism field to believe that CDC management has serious cultural challenges. “There are no consequences for failure at CDC,” said Richard Ebright, a Rutgers University chemist and molecular biologist. Under both Frieden and his predecessor Dr. Julie Gerberding, “there were repeated significant violations of bio-safety and bio security standards and requirements to report violations,” Ebright told Government Executive. “It’s a consistent pattern” that CDC employees do not report up the chain of command. During a crisis, the procurement system “doesn’t work very fast. And when things go wrong in the lab, it’s easy to say this didn’t work–the retrospective scope is a powerful tool,” Benjamin said. “It’s hard to say what the impact might have been if they’d had enough training and resources. The real issue is how to recover” from the missteps. The management and safety issues confronting CDC have been evaluated by the Government Accountability Office and the Health and Human Services Department’s inspector general, in addition to its reports produced internally. In a July 16 report on recent “biosecurity incidents,” GAO observed that “no federal entity is responsible for strategic planning and oversight of high-containment laboratories. Since the 1990s, the number of high-containment laboratories has risen; however, the expansion of high-containment laboratories was not based on a governmentwide coordinated strategy” or research. The inspector general, in a Jan. 29 report, faulted CDC’s Procurement and Grants Office for failing to “monitor and evaluate clinic compliance with contract terms and conditions as required by federal regulations” intended to assure proper surveillance of lab handling of pharmaceutical supplies to victims of the World Trade Center attacks of 2001. Similarly negative reports on dangerous lab security—lax employee access procedures, for example -- go back to 2008 and 2009, according to reports by USA Today in 2013. The issues cited in the IG reports are "troubling," Rep. Fred Upton, R-Mich., chairman of the House Committee on Energy and Commerce, said at the time. With the Ebola crisis deepening, chiefs of both the American Hospital Association and American Medical Association on Oct. 19 were asked on CBS News’ “Face the Nation” whether they retained confidence in the CDC. “Yes. We work very closely with them,” replied AHA President Rich Umbdenstock. “We understand that they are operating in real time with this as well. They are the nation's expert. They are frankly the expert to which the world turns.” The AMA’s Dr. Robert Wah also said he had “every confidence” in CDC. The Public Health Association’s Benjamin said he still sees CDC as “the best agency on the planet. If I were in a foxhole, I’d choose Frieden” and National Institutes of Health executive Anthony Fauci to be there too, he said.